On 06/Sep/2008, Myself & Natarajan(Dream India, IS Partner Organization) visited to Govt Children Home for Boys, Royapuram, Chennai and had the discussion with Mr.Thanasekara Pandian(Superdent) & A.Glory Gwaseli about our planned Reception projects. First we are planing to start Learning & Computer Center projects for Reception students. Currently we are searching a teacher(Who knows Hindhi, Tamil &Telugu) to deploy in this Learning Center. Teacher salary will be expected from Rs.2500+ per month. 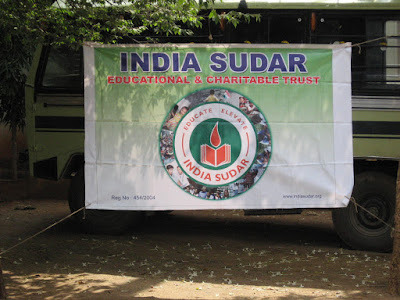 Our Partner Organization Dream India ready to execute this Reception Students Porject together. Last Saturday(Aug 30,2008) Myself, Ravi, Ram & Reshma Kurup visited the Govt school in Seshadripuram to distribute 50 note books & geomentry box for X std students. Earlier our member Reshma had brought to our notice the requirement of this school. She has been associated with this school for few months now, conducting Art of Living classes to the students. – The campus has both middle school & high school together. Infrastructure has been provided by Rajasthan youth association. So infra is decent enough J ! – High school has 200 students, lower class has 230+ students. – No fee is being collected. School has both kannada & English medium. About 30% are in English medium. – Need some volunteers to help 9,10th std kids with their studies. – Another computer teacher if possible for students in lower class. The current teacher deployed by NIIT handles only for one teacher. He handles daily class for 8,9,10 class. – If any notebooks requirement come up they will inform us through Reshma. Hassan Doddagaddavahalli Govt Composite High School. One Saturday 23rd Aug we (myself, Anil, Sharath) had been to Doddagaddavalli Govt Composite High School, Hassan. Below is the visit report. – There are currently 145 Kids in the High School and 123 Kids in the Primary School. Both High school and primary schools are having different building. – Currently there are 15 Staff members, 10 for High school which includes 1 clerk and 1 admin and for primary 5 teachers. – Govt has sanctioned 10 computers last year but till now its not dilevered. High school has dedicated one separate room for the same. – SC/ST kids Govt is providing free notebooks. As per HM 4 note books per kid. – Govt gives out the 1 pair uniform to the kids and School as asked the parents to get one more set of uniform on there own. – In the High School we can see that all the kids are neatly dressed. – Govt has given 7500 Rs for the vessels, which HM claims that its not sufficient and need more. – On a average there are 10 Kids dropout every year, due to the financial problems. I had asked HM to get the list of dropouts, so that kids who are interested can continue the studies further. – Pass percentage last year was 75%, which was dropped to 45% this year. – Most of the parents are agriculturist. – Kids come from the 11 villages. – Currently there is no funding coming from the local bodies, abs’tly zero funding. – Fees collected from the kids are utilized for the note books and other extra activities. from High School Kids Fees collected is 150 Rs. – No. of students X 150 is the budget for the whole year. – Above fees are collected from non SC/ST kids. – State Govt has started a program called “PRITHIBA KARANJI”, which is a science exhibition where in kids can show there talents and teachers help the kids. For this program school have won 30 Prices so far. HM gave us the list of students who are going to take part in the district level science exhibition. – Currently there are no note books requirement as per the HM. As they have utilized the school fees to give out the note books to the kids. And there are some requirement which might come up start of the next year. And said that she will contact us. – There is a urgent requirement for the cooking vessels, Currently there are only one set of vessels and where in the food is prepared. Food is prepared in the Primary school and the High school kids have to talk 1 KM to have the food. HM requested that if we could provide a set of vessels and plates for this year then that would be great.